Supination is one of three different foot strike positions possible for any person to have the other two being a neutral foot strike and the overpronation foot strike. This article looks at what supination is, the possible causes, and how to combat it. One very important thing to do if you have a supination foot strike especially if you run is to wear the right shoes. Failure to do this will lead to injuries being sustained. Apart from the above, this article also provides a guide to choosing the best shoes to run in for people who have supination. Supination (underpronation) is a condition whereby your foot turns outside when you move. This results in all of your body’s weight being deposited on the outside of your foot. This puts a lot of strain on the outside of the foot and weight is not evenly distributed. This condition usually comes about as a result of rigid joints, the ankle having strength and flexibility imbalances, and heel or ball alignment issues. If special shoes are not used while running, underpronation will cause pain in the ankle, the outer toes, and the lower foot. This is definitely something that anybody wants especially someone running. Choosing the wrong shoes will lead to pain and this makes it quite imperative that the right shoes are chosen. The pain experienced when you choose the wrong type of running shoes will eventually result in injuries if things continue the same way. This is only logical. Bruises, blisters, sores and the likes are likely to develop especially in places like the ankles when the wrong shoes are worn. In order to run efficiently, it is quite important that the shoes you wear provide you with as much comfort as possible which wouldn’t be the case if you have the wrong shoes on. The wrong shoes refer to shoes not made for your condition and those that fit poorly. This is yet another important reason to conduct your research and choose only the best shoes. A shoe made specifically for someone who has supination will enable that person to work as naturally as possible. This means that with the right shoe, walking would be just as it would be if you had a normal foot strike. Saucony, for several years, has gone through the process of creatively engineering systems that will work to provide comfort and optimize the performance of athletes no matter their activity. Saucony Men’s Triumph ISO achieves that aim. With an ISOFIT upper, the running shoe is able to adapt to the shape and movement of the foot as well as its size. This results in a custom-heeling fit for the athlete. Saucony Triumph ISO was designed to be lightweight and responsive. It makes use of a PWRGRID+ midsole cushioning which provides 20% more cushioning than other standard midsoles. This shoe also has a breathable mesh upper that allows you to stay dry during your run which leads to optimum comfort. 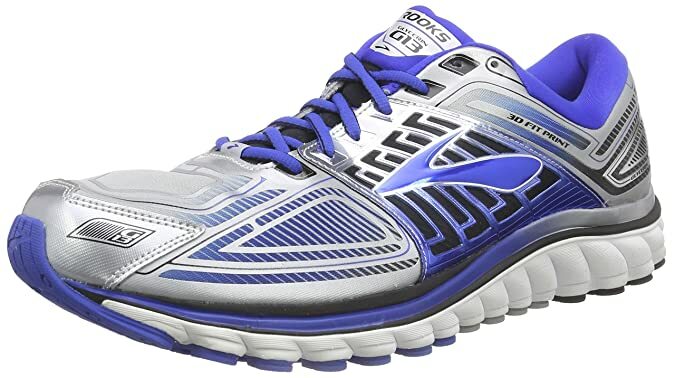 The Brooks Glycerin 13 is the ideal running shoe if you like to run long distances. Built for people with a neutral foot strike as well as for those with underpronation, it has an element mesh upper which provides protection from the elements. The fabric is lightweight and breathable. Brooks Glycerin 13 possesses a 3D Fit print overlay which provides structural support while being lightweight. It also has an adjustable saddle construction that allows the shoe to fit snugly. The shoe has a soft fabric lining which provides you with a great in-shoe feeling. And the insole is a removable foam material. The running shoe includes a segmented crash pad which helps to absorb shock from impact hence enhancing efficiency. There are ideal pressure zones in the outsole of the shoe that enhances pressure distribution across the heel and forefoot of the shoe thereby ensuring that the body’s entire weight is not on the outside of the foot. Brooks Men’s Glycerin 13 also has a super DNA midsole which is full length. This enables it to provide optimum support, increased energy returns and maximum cushioning. Saucony is one of the most respected names in the world of running shoes. The company provides feel, fit and performance in all of their products which enables the athlete to give their full focus to the activity they are engaged in. 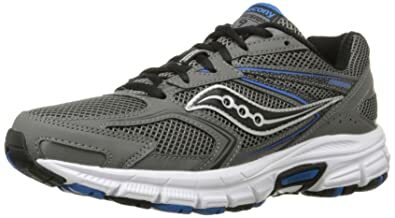 Saucony Cohesion 9 utilizes advanced technologies such as Grid which provides sole-based stability and exceptional cushioning. This running shoe includes flex grooves which are fitted to the forefoot so as to ensure a more flexible run. 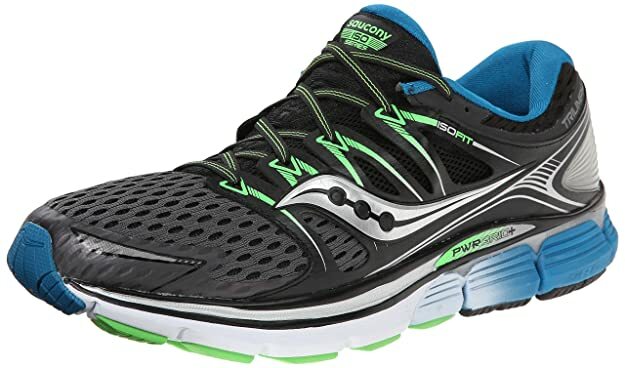 Saucony Cohesion 9 makes use of a heel grid system which is embedded into a responsive midsole foam in order to provide stable cushioning. The running shoe also has a breathable mesh upper that allows you to stay cool and comfortable through your run. It provides exceptional cushioning and flexibility for its users. 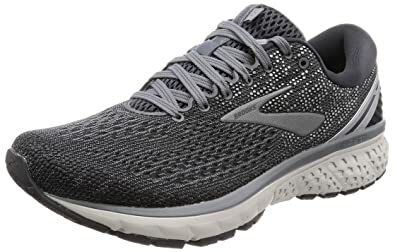 Brooks Men’s Ghost 11 is a brand that is designed and constructed with smart technologies that will provide you with the right fit and function for every run you make. This running shoe provides you with three levels of cushioning to choose from. The first level, level 1 has a minimal cushion, level 2 has a medium cushion and level 3 has a high cushion. 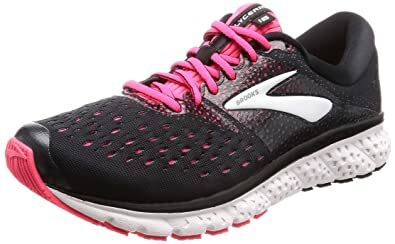 Brooks Men’s Ghost 11 also has a feature for an energized experience which is responsible for the spring responsiveness of the running shoe, thereby adding extra lift to each stride you take. This feature also exists in three levels, with level 1 being the least and level 3 the highest. The amount of spring and responsiveness you get increases with each increase in the levels. Apart from the aforementioned properties, this particular running shoe provides you with a connected experience and this includes flexibility and lightness which enables you to run naturally. There are also three levels to this which you can choose from. And as the level increases, so does the connected feeling. 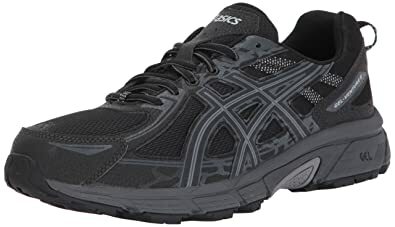 ASICS, the company that produces these running shoes has existed for over 20 years. 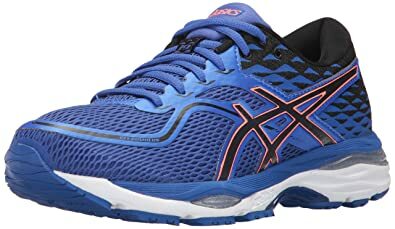 ASICS Men’s Gel-Nimbus 20 is proof of the evolution the company has undergone and its dedication to growth and quality. The running shoe makes use of a lightweight FLYTEFOAM technology cushioning which provides you with exceptional bounce back and responsiveness. It has a FluidRide midsole and discreet eyelet construction which helps enhance the comfort derivable from it. It is suitable for a runner with a neutral foot strike. The running shoe also consists of a gradient jacquard mesh FluidFit upper which works to adapt to the natural motion of your feet. Alongside the mesh upper, there is a 3-D printed overlay that provides additional support which has the effect of allowing you to increase the length of your runs. The shoe makes use of a rearfoot and forefoot GEL Brand technology that minimizes the shock that comes with impact thereby allowing for a smooth and painless running experience. 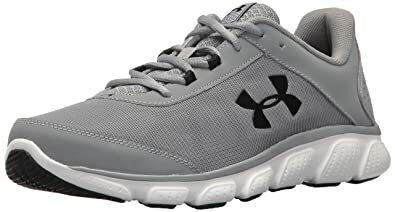 Under Armour Micro G Assert 7 Sneaker is a running shoe constructed with a lightweight upper mesh that is designed to deliver optimum breathability. This helps to enhance the comfort the shoe provides which in turn results in exceptional performance. The running shoe also possesses a durable leather overlay that provides stability and locks in your midfoot. The shoe features an EVA sock liner that provides soft comfort. There is a piece of Micro G foam that is able to provide ultimate comfort for the user. Furthermore, in a bid to cover high impact zones to ensure greater durability as well as little weight, a solid rubber outsole is used. The ASICS Men’s Gel-Venture 6 was designed for the purpose of taking on rugged terrains such as shales and rocks. The model is made up of a variety of materials such as rearfoot gel cushioning which reduces the shock you would normally experience when your foot slaps the floor. This has the effect of the runner having improved comfort during running. The running shoe is equipped with a trail-specific sole and high abrasion rubber which help achieve high traction necessary for standing upright. ASICS Mens Gel-Venture 6 also has a removable sock liner, which allows you to input custom orthotics in order to achieve a better fit and better comfort. The trail-specific sole includes reverse lugs which provide tractions uphill, downhill and on all types of terrain. And for exceptional durability, an AHAR (ASICS High Abrasion Rubber) is placed in strategic areas of the outsole. Definitely, the best women’s running shoe for supination, New Balance Fresh Foam has been created to provide optimum comfort for the user. This running shoe makes maximum use of fresh foam, harnessing it to provide a plush and stable feel. Coupled with the Fresh Foam is an engineered mesh forefoot along with carefully structured support for the midfoot, thereby providing comfort and superb quality from top to bottom. For more than a century, New Balance has been involved in providing athletes with materials to help them achieve their goals. This is evident in the New Balance fresh foam which is designed to fit snugly and comfortably such that it can aid athletes in achieving the best they can. Ever since it was established in 1906, Mizuno has taken special pleasure and pride in making a meaningful contribution to sports. It has achieved this through the production of quality, and aesthetically appealing products. 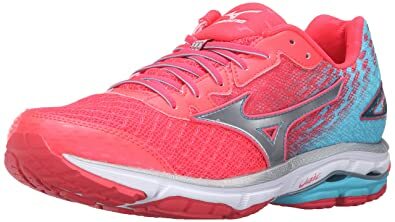 An example of this is the Mizuno Women’s Wave Rider 22. 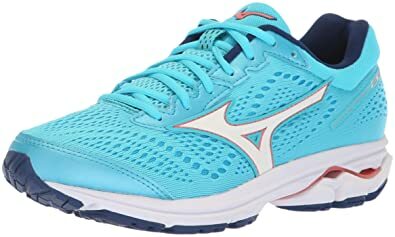 The features possessed by this particular shoe help enhance the performance of athletes in ways unique to Mizuno while at the same time providing comfort. The Mizuno Women’s Wave Rider 22 makes use of a two-layered engineering mesh upper that provides enhanced breathability and comfort. Along with the mesh upper, it also makes use of Cloud wave cushioning technology that softens shock associated with the user’s foot hitting the ground. It also maintains a responsive session for the user. The Brooks Ghost 11 is a running shoe that is equipped with lightweight construction, along with a smoother ride from the heel to the toe that ensures that the athlete’s performance does not dwindle. 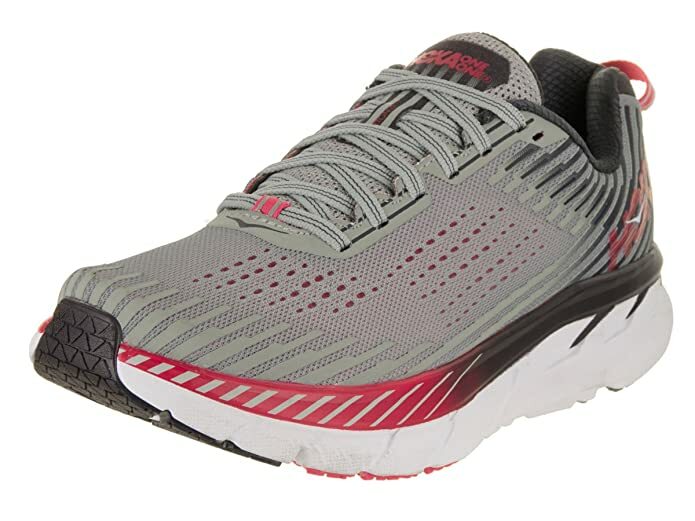 This running shoe is constructed with high energizing cushioning and provides neutral support. 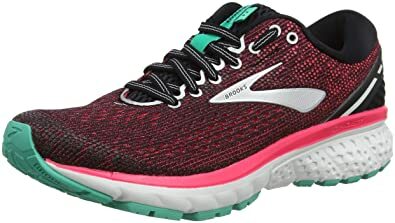 Brooks women’s Ghost 11 also provides medium to high arch support. It has an engineered mesh upper which ensures the breathability of the shoes while at the same time affording the athlete the opportunity to stretch when required. In order to provide the users with a great in-shoe feel, a soft fabric lining was used. Also, a removable foam was inserted into the shoe so as to ensure optimum comfort and support are available. In order to provide a secure fit, the rubbing shoe makes use of a 3D printed overlay which provides strategic stretch and structure. Apart from the overlay, the shoe has a plush interior bootie that provides the users with durability and responsiveness, along with a padded tongue all of which comes together to provide optimum comfort for the user. The Clifton 5 has been used to win awards, as a result of the quality and comfort it provides. Hoka One One Clifton 5 is a running shoe that was designed with lightweight construction while at the same time being very cushy. A major part of the design of Hoka One One is the midsole geometry and the foam package that is inserted into the foam in order to ensure that it has a consistent cushioning throughout its lifespan. Combined with the adaptive feature of the forefoot, the shoe provides a smooth running experience. Finally, the running shoe has a clean and engineered mesh upper that enhances breathability and comfort. 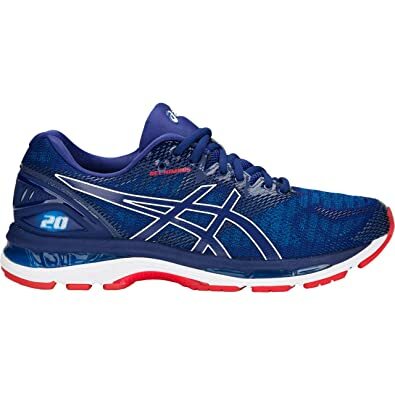 The ASIC Gel-Cumulus 19 is a quality running shoe that was designed to deliver superior comfort and shock dissipation. At the same time, it enhances foot function which helps get a smooth run. This is achieved through the use of rearfoot GEL Brand technology cushioning. The rearfoot and forefoot GEL Brand technology help reduce shock certain to occur as a result of impact and toe-off phases, thereby permitting movement in several planes. Seamless materials are used in the production of the Gel-Cumulus 19 as they reduce the possibility for friction and irritation caused by traditional seams and stitches. The Mizuno Wave Rider 19 is a perfect combination of performance and comfort and it boasts of an enhanced underfoot feel for runners who desire a soft and responsive training. Mizuno seeks to provide equipment that possesses high quality, and this they achieve by combining both technology and craftsmanship. The Mizuno Women’s Wave Rider 19 is produced for the purpose of enhancing the performance of the athlete and producing comfortability during these performances. There are a number of factors you should be on the lookout for when buying a supination shoe. Without these, you will purchase a less than satisfactory shoe which will in no way help your condition. The kind of shoe you get will determine whether or not you will have a comfortable and stress-free running experience. The following are those things you should observe and be on the lookout for when buying a shoe for your supination. All shoes can be categorized into three categories based on the type of support they offer. These are overpronation, neutral and underpronation. As already said, supination is a situation whereby your foot rolls outward when you walk and run. This results in the outside of your feet bearing the entire weight of your body. An overpronation foot strike is the direct opposite of supination (underpronation). It is a situation whereby your foot rolls inward when you move which results in your body weight resting on the inside of your feet. A neutral foot strike is balanced and does not have the body’s weight resting on any of the aforementioned places. For someone who has supination, a shoe with a mid to high arch support is recommended. The type of arch you get should, however, depend on how arched your foot is. A person with medium arches can still make do with a neutral running shoe to an extent. Somebody with really high arches, however, requires nothing less than a full out supination shoe with high arch support. While it is advisable that every shoe meant for running and working out should be flexible to a degree. It is especially important and essential for a runner with supination. This is because a flexible shoe will help bolster a natural step than you would normally achieve. This will be done by increasing the inward movement of the foot. Apart from this, the impact of your feet on the ground will be evenly distributed. This takes the strain off your body’s weight off the outside of your foot and places it on your entire foot. It is for this reason that shoes with a soft midsole are recommended while those with a dual density midsole are discouraged. Another important factor to consider before you buy that shoe is just how breathable it is. The breathability of a shoe determines just how comfortable that shoe will be. This is because a breathable shoe wicks moisture away which results in the feet being dry and comfortable. This is especially true for people who have supination as the absence of moisture in their shoes will help control the rolling of their feet. So, go for a shoe with a breathable upper mesh. One with gel uppers and soles will also work quite well. The purpose of a medial post is to help inhibit the side to side movement that would occur for someone who has supination. Medial posts are basically found only in shoes of those who have supination. So, if you are looking for a great shoe for your supination, you should look for one that has a medial post. This will help control the impact of your feet on the ground while running. It will also provide you with more stability than you would find in a shoe without one. For a person who supinates, cushioning is very important. This is due to the amount of impact a person who underpronates is prone to. When a person with supination runs, the weight of the entire body is placed on the outside of the foot. This puts a lot of pressure on the ankle and a couple of outer toes which will result in pain in those areas as well as in the lower section of the foot. And if such continues, an injury can develop. It is for this reason that shoes with a lot of cushioning are best for people with supination. This is because the extra cushion present will help absorb some of the shocks that come with the foot’s impact on the ground. This translates to less pain strain on the ankle, the outer part of the foot and the lower leg region. And this ultimately eliminates the pain that would otherwise be experienced. Can supination shoes be used for other purposes apart from running? Yes, they can. You can walk, jog, work out and even work in your supination shoes. Most supination shoes are versatile and as long as they provide you with the comfort you need, then, go ahead and do whatever you want in them. What can happen if I ignore my supination and use normal shoes? Ignoring your supination is not a wise thing to do. As already mentioned, running around in shoes not supportive of supination will result in pains in certain areas of your feet. This will only worsen if further ignored and left untreated. Supination shoes have a cushion that will help you cope with your condition. Without these, you would be exposing yourself to pain and possible injury. This depends. In most cases, underpronation is a temporary condition which, if diagnosed and treated early can be fixed. So, if you notice that you have underpronation, visit your doctor and with the right care along with the right shoes, you might just get rid of it. Should I choose shoes that are a little loose? No, you shouldn’t. Choosing a shoe that is either too tight or too loose will defeat the purpose of buying a supination shoe in the first place which is the comfort. Go for a shoe that fits you just right and you will be fine. As long as the cushion is right and it is comfortable, buy it. 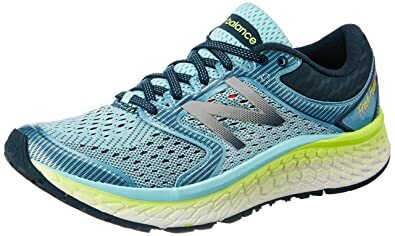 The best running shoe for supination will possess a lot of features such as durability, flexibility and cushioning and no other shoe has all these in a balanced and perfect proportion like the New Balance Women Fresh Foam 1080v7 (for women) and Saucony Men’s Triumph ISO Running Shoe (for men). Combine this with the fact that they provide a lot more value for their price than most shoes in their price range and you will know that you can’t find much better. I have carefully chosen all the shoes on this list from dozens of other shoes and you can rest assured of their quality. Those two, however, stand out and will provide you with more than enough value for your money.